For interior designs with a more traditional or period feel, we offer a range of traditional architrave styles to suit. We manufacture replicas of specific architrave profiles used in different historical periods (Victorian, Edwardian Georgian etc.) as well as some other detailed profiles inspired by traditional architrave designs. If you have a particular architrave design that you need to replicate and you cannot find it on our site, we do offer a bespoke service whereby we would recreate the profile you need exactly. Our sales team can offer further advice and help with this. When fitting traditional architrave and skirting it is normal for the architrave to be slightly thicker than the skirting. 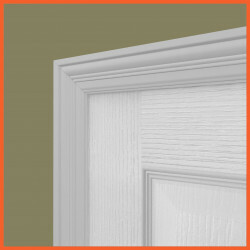 If your skirting board is 18mm thick then the architrave would be 25mm to be true to the traditional styling. The reason for this is it masks any discrepancies in the shape of the walls onto which the architrave is to be fitted. An elegant alternative that is found in a lot of traditional interior design schemes is to incorporate plinth blocks at the base of the architrave. 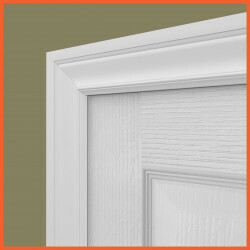 There is also the option of adding rosettes to the top corners of the architrave door surround, which not only creates an authentic traditional design but also saves the need to mitre the corners of the architrave. Traditionally, architrave and other interior mouldings have been painted in a white gloss- mainly because gloss tends to be a more durable finish. We offer a hand-sprayed gloss finish on all of our profiles that will save a lot of time on site as the architrave will arrive pre-finished and ready to install immediately. The Asmara 4 Architrave is an intricate homage to classical period design. The fluted apex of the Asmara 4 has a gradual taper that is not too dissimilar from architrave widely used in the late 1800’s. This profile would without doubt work well in an older property, or within any design scheme inspired by the grandeur of 19th century interiors. Our Colonial architrave is a replica of a design that was common in the late 18th century. For anyone renovating a property from this period who is keen on remaining sympathetic to designs of the time, the colonial architrave is a natural choice. This architrave will also work well as a detailed accent for a simplistic or minimal interior design scheme. Regency architrave is not too dissimilar to the Ogee style in terms of overall design. The curves on the Regency are a little looser, creating a series of semi-bold ‘waves’. The Regency period began in 1811 and lasted until 1820. 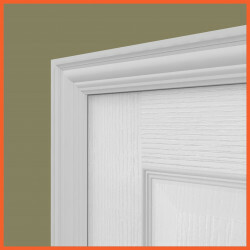 Our Regency architrave has been designed to replicate the style of architrave used at this time.